Sweet N Spicy Mix is a healthy snack for the office or on the go. 1.75 oz. packs of trail mix also offer a single-serve snack for the breakroom. 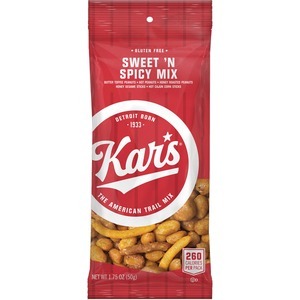 Mix contains peanuts with a butter toffee coating, roasted peanuts, honey roasted peanuts, Cajun Corn Sticks, and roasted sesame sticks. Ingredients: Peanuts with a butter toffee coating, roasted peanuts, honey roasted peanuts, Cajun Corn Sticks, and roasted sesame sticks.